As part of its new campaign to appear more customer-friendly, Ryanair is to offer a range of discounts for parents travelling with children.The airline’s new Family Extra service includes a free 5kg infant bag allowance, reduced infant fees, a 50 per cent reduction on allocated seating charges for children and discounted priority boarding.The move follows the introduction of fully allocated seating in February, which had been a major source of irritation for families travelling with the airline, as they could not guarantee they would be seated together. The new service also offers in-flight bottle warming and baby changing facilitiesas well as the ability to bring two free pieces of infant equipment such as buggies or cots. The airline has been on something of a charm offensive in recent months after shareholders complained the company’s poor reputation for customer care was costing it financially. As part of this rebranding, the airline has in recent months introduced a range of customer-friendly upgrades to its service including more allocated seating, a more user-friendly online booking process and less punitive airport check-in fees. Mr Jacobs also indicated that the airline would soon unveil a new easier-to-use mobile phone app as well as a “tailored business product” to expand beyond the no-frills model. Rival EasyJet is also seeking to upgrade its service from the budget bare-bones offering by wooing more business customers as well as serving more first-tier airports. 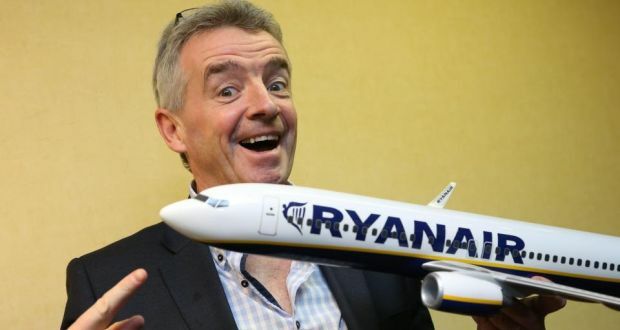 Separately, Ryanair’s head of marketing Peter Bellew said the airline is interested in participating in the privatisation of Spanish airport operator Aena, of which the government wants to sell a minority stake. “We think they should sell out 100 per cent of Aena, but we are interested in the whole process,” Mr Bellew said, reiterating earlier comments made to Spanish reporters before a presentation in Madrid. Ryanair is one of Aena’s biggest customers, along with IAG , the owner of British Airways and Spanish carriers Iberia and Vueling. The Spanish government said last week it wanted to sell up to 49 per cent of heavily indebted Aena, the world’s biggest airports operator valued at around €16 billion. It plans to sell 28 per cent of Aena, which owns 46 airports at home and also has international interests, in a public offering on the Spanish stock exchange and auction an additional 21 per cent to long-term investors. “We meet these conditions. We have the money and we are long term investors,” Mr Bellew said. Ryanair has liquid assets worth close to €3 billion, including the proceeds of a recent €850 million bond issue, he said.